In the inky blackness of a wintry night in Johannesburg North, I can hear the buzzing of my refrigerator, the hum of my computer, the keys of the keyboard echoing as I type. Silence in the city is golden. 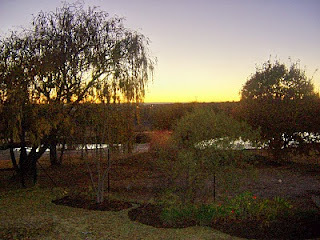 Johannesburg is one of the largest cities in Africa; the largest city in the world not situated on a coastline or port. It hums constantly and rattles with activity that rivals New York City. The economic capital of South Africa, the city itself reminds me of Los Angeles -- sprawling, desperate, wealthy and poor at the same time. We live on a small parcel of land that doesn't belong in Joburg - a place that is in the center of an equestrian estate called Northriding. We are so near to Northgate, a mall that crowns Northern Joburg, that it takes us 5 minutes to get there. Even so, when you turn into the gated estates on a dirt road, you feel like you are entering another place. A rugged, quiet and purposefully unpaved neighborhood that is meant to be what it is: a retreat. When we first came to Johannesburg, our friend Hennie introduced us to Stewart and Gill Patterson, our landlords, who had a vacant cottage on their property. They are on the international team of NCMI and understand our vision, our desire to follow God and the sacrifice that it takes to live here. They have provided us with this sanctuary and it has really been a blessing. Stewart keeps fowl of all kinds, especially competitive pigeons, and their home has a large lake in the backyard that attracts water foul that are spectacular. The national bird, the Blue Crane now and then gives us a treat by stopping and fishing there; plovers and geese are regular inhabitants. From our back porch we can see the skyline of the Northern City, but we can't hear it. We can have a country experience from the top of the city, feeling removed from the 3,888,180 people that supposedly populate the city. We are grateful for the peace; grateful for the cottage; grateful as anything that we are appointed to live here for a time.